Your small group is comprised of people who have been set apart by God to be holy. He made them holy by means of Jesus’ life, death, and resurrection. They are saints. They belong to God. And God has given them everything they need to fulfill His mission until Jesus returns. He will keep them strong in their battle against sin and a world that is increasingly hostile to the faith. But your small group is full of people who forget these things. They stop telling themselves these things. They try to take matters into their own hands. They occasionally fall back in love with their old sinful habits. They succumb to the pressures of temptation and relinquish the progress they’ve made in their quest to change the world for Jesus. It’s with these two realities in mind that you gather together on a regular basis as a group. They are saints who are also sinners; victors who often feel defeated. So what purposes can your group have given these realities that will not go away until Jesus comes back? First Corinthians gives us at least three purposes to keep in mind when you gather as a group. “Now I urge you, brothers, in the name of our Lord Jesus Christ, that all of you agree in what you say, that there be no divisions among you, and that you be united with the same understanding and the same conviction” (1 Cor. 1:10). Few things can deflate an embattled, frustrated, and fatigued Christian like a small group that does not relationally mirror the unity they have in Christ. Conversely, few things can encourage brothers and sisters more than coming to a place where they know at the very least they have Jesus in common, and that clearly matters more than anything else in the room. Don’t waste your small group trying to unite around something other than Jesus. Throughout 1 Corinthians, Paul confronted multiple kinds of sins devastating the church and its mission. Sexual immorality, a lack of discipline or accountability, lawsuits, arguments over peripheral things, a lack of concern for the welfare of members in need — all of these things and more wreaked havoc on the church, and they do the same in our groups. The corporate worship environment rarely allows for the kind of personal accountability Paul calls us to in this letter, but the small group environment exists for this kind of personal accountability. Don’t waste your small group pretending sin isn’t real. Strive for purity. Part of Paul’s ministry at the time he wrote this letter was to gather a monetary collection from many other churches for the church in Jerusalem. It’s a theme he carried over into his other letter to the Corinthians as well. Why? Because financial generosity is a powerful testimony to Jesus’ generosity: “For you know the grace of our Lord Jesus Christ: Though He was rich, for your sake He became poor, so that by His poverty you might become rich” (2 Cor. 8:9). Don’t waste your small group by pretending the needs of the world aren’t great. Strive for generosity. Should your group strive for these things, you’ll be serving one another and the church at large well. And if you want to study these things further, head over to smallgroup.com and sign up for a free preview. 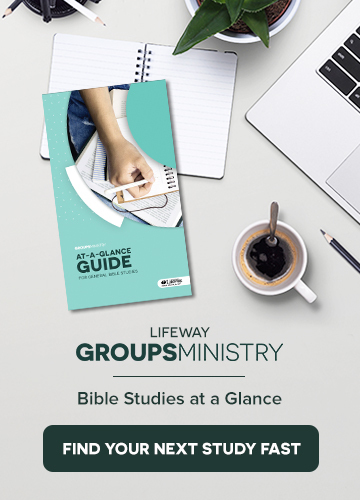 You can quickly customize a series of studies on these topics and texts that is perfect for your group, so you know you won’t be wasting your time together as you strive for unity, purity, and generosity. Rob Tims is a Christ-follower, husband, and father of four and lives in Nashville, Tenn. With more than 20 years of ministry experience in the local church, Rob works at LifeWay Christian Resources on a team that provides trustworthy, customized Bible studies for individual churches. He also is an associate professor for Liberty University Online and enjoys preaching and teaching in various venues throughout the year. His book, Southern Fried Faith is available exclusively on Amazon for Kindle or in print.